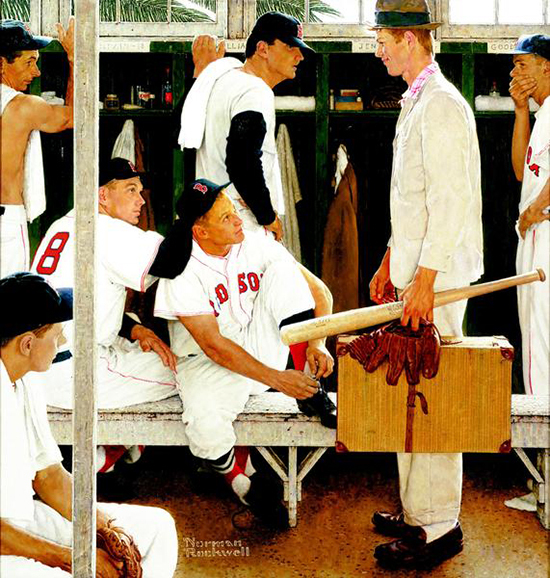 Norman Rockwell's iconic baseball painting, The Rookie (Red Sox Locker Room) has sold for $22.5 million. Sold through Christie's Auction House, the work first appeared on the cover of the Saturday Evening Post on March 2, 1957. It features several members of the Boston Red Sox, most notably Ted Williams, making their first impressions of a confident youngster (who bares a resemblance to Mickey Mantle). Other Red Sox veterans featured are Sammy White, Jackie Jensen, Billy Goodman and Frank Sullivan. "In the mid-50s if the front office told you to drive to Stockbridge, and bring your uniform, that's exactly what you did. On an off day in 1956, Goodman, Sam White, and Jackie Jensen were told to motor west to the western Massachusetts town. When we got there we were greeted warmly by a small, slim man, whose name meant nothing to me. He posed us and took a number of pictures, explaining that the background would be the locker room we used in Sarasota, Florida, for spring training. I remember ragging on Jackie Jensen on the way back, saying the trip was all his idea, and the photographer didn't seem to know what he was doing. The following March, I pick up The Saturday Evening Post, and there we were on the cover. The man was an illustrator, not a photographer, and if you look closely, you'll see we are wearing street shoes, not spikes. The cover was titled 'The Rookie' and the man's name turned out to be Norman Rockwell." The Norman Rockwell Museum has reference images posted that show how the painting came to be. Both the buyer and the seller have remain anonymous. The painting measures 41" x 39" and has been on display several times including a pair of exhibits at the Boston Museum of Fine Arts in 2005 and 2008. Other famous Norman Rockwell baseball paintings include The Dugout, Bottom of the Sixth and Knothole Baseball. Norman Rockwell Baseball Prints Laminated When New Lot Of Three 13.5" x 12"
NORMAN ROCKWELL 1997 Engagement Book Calendar REDUCED!